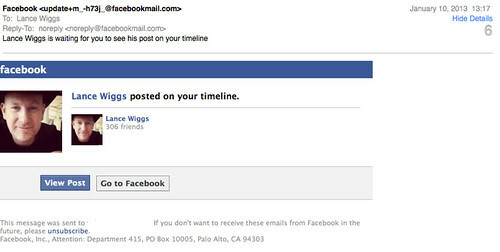 Facebook on facebook, originally uploaded by LanceWiggs. Facebook for me is a destination for my Twitter feed, and I seldom login. One result is that I get these strange emails from Facebook, that tell me to login to read my own feed. It’s all very meta, and what’s more this post and the tweet that it auto-spawns will also get posted on Facebook, and I guess I will eventually get a reminder to read it. None of this makes me want to spend more time on Facebook.